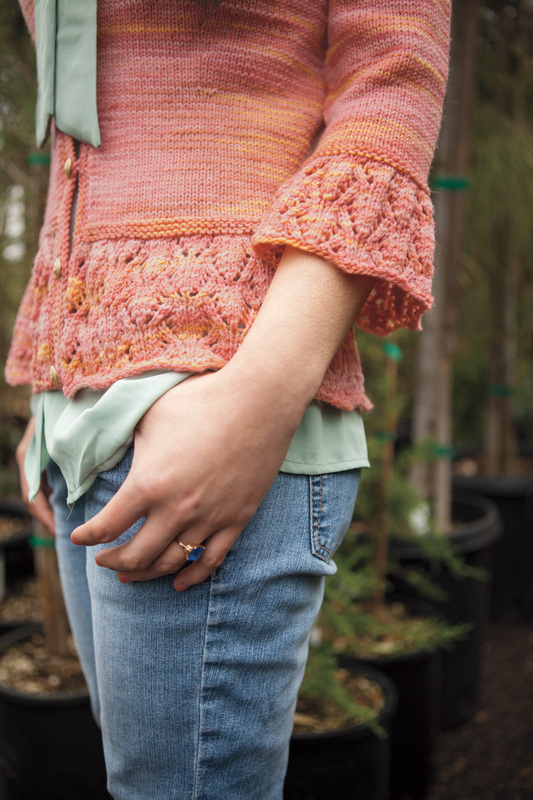 Sharee Cardigan is part of Knit Picks In Bloom collection. The Sharee Cardigan is a light and feminine sweater for the warming days of spring. The body and sleeves are knit in stockinette stitch, while the peplum and cuffs are worked in lace. This cardigan features an open v-neck and bust darts for a flattering fit. Garter stitch bands finish the edges and divide the waistband from the body. 31 (35, 39, 43, 47, 51, 55, 59, 63)” finished bust measurement; garment is meant to be worn with zero ease. Queen Anne 24911, 3 (3, 3, 4, 4, 4, 5, 5, 6) skeins. US 5 (3.75mm) straight or circular needles, or size to obtain gauge. 22 sts and 29 rows= 4” in Stockinette stitch, blocked. 17.5 sts and 29 rows= 4” in Lace pattern, blocked. If you are having difficult with the peplum decrease row, see my blog post here.